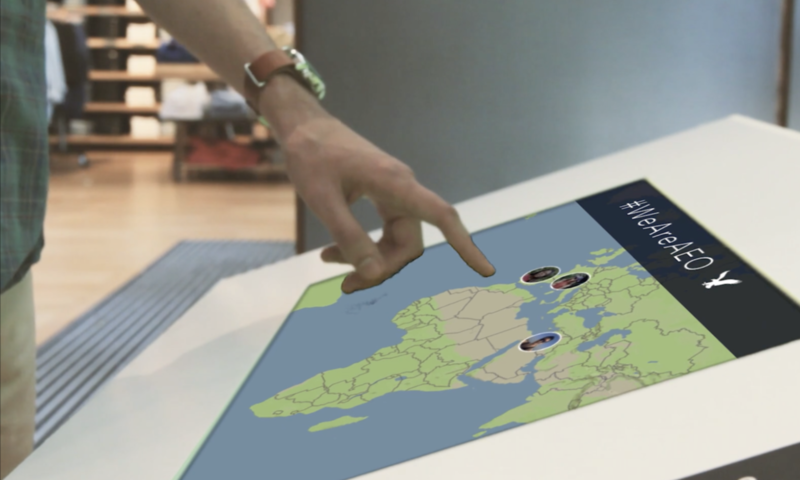 Rethinking the role of the brick and mortar retail experience to create regional pride, global connection, and a brand community. 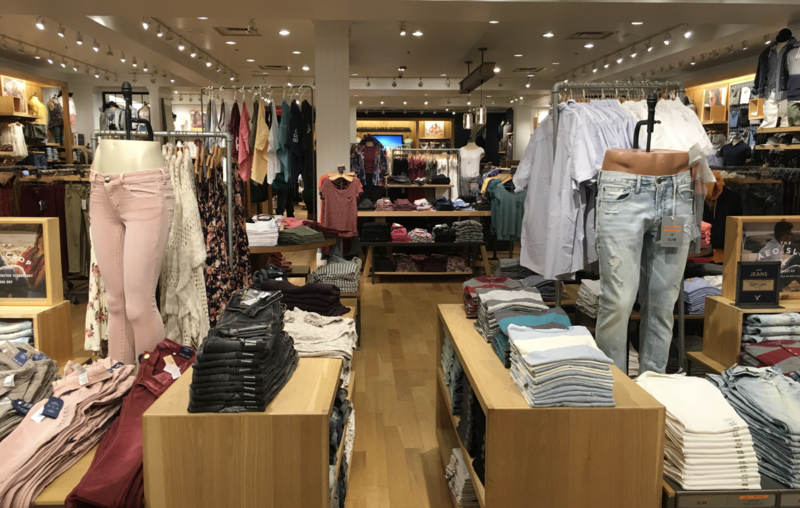 Partnering with American Eagle Outfitters, this project dives into the relevance the brick and mortar retail experience means, and what affordances it brings to the company. 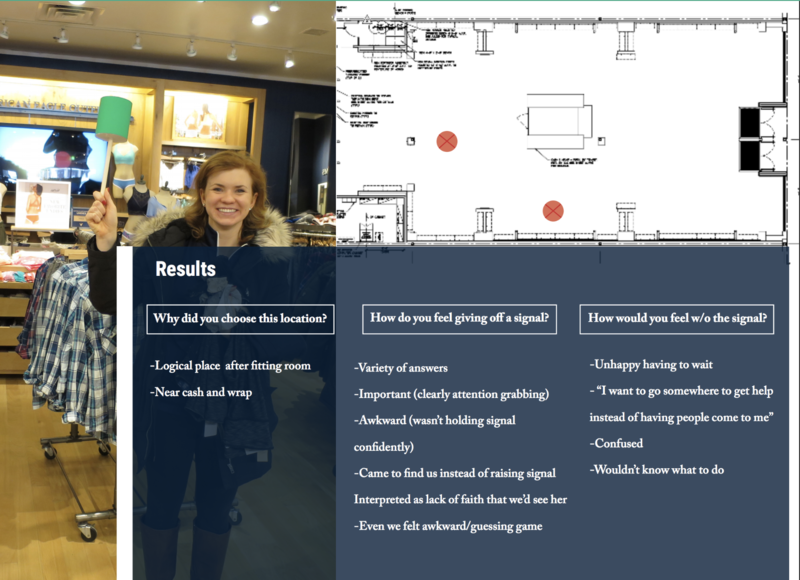 This project also exercised a critical perspective of the current technology injected into retail stores, and how it can be used as an asset for differentiation and enhancing brand culture/engagement. Inclusivity and differentiation is at the heart of the brand. On the very first day, American Eagle presented their brand values, mission, and plan for the future, They introduced campaigns like "Aerie Real", emphasizing that they want to be a brand that is different– both in culture and sales. 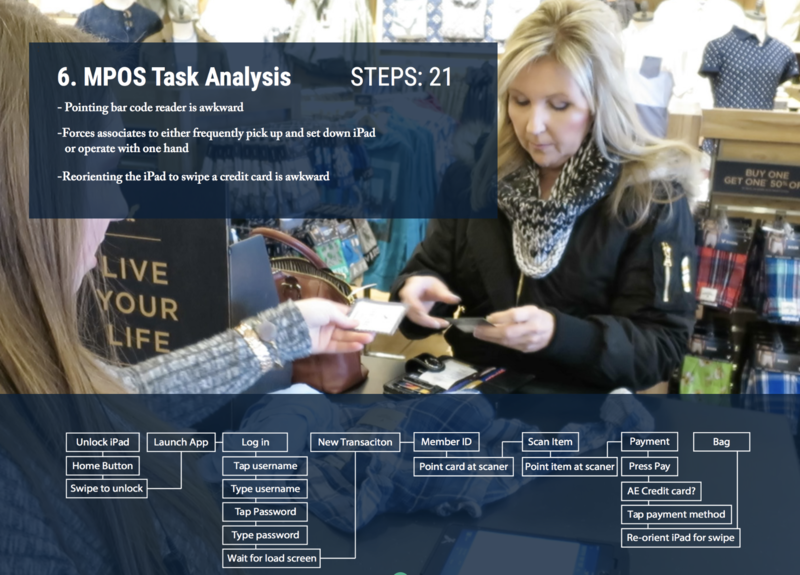 As a result of seeking differentiation and relevance, they've made a decision to be a future-forward company, wanting to integrate tech into stores, remove cash registers, and redefine the retail brick and mortar experience. 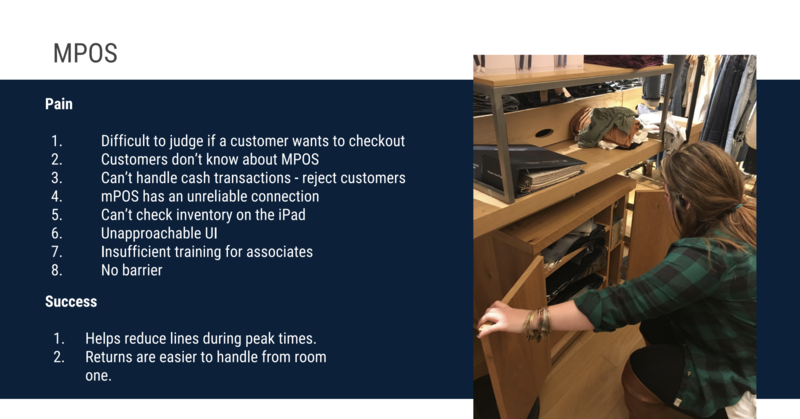 Being eager to create the "Store-of-the-Future", they've invested huge amounts of money on new tech processes too quickly (ex:MPOS-Mobile Point of Sale devices, iPads, Bluetooth beacons to be used with their customer app, abolishing the register, etc). 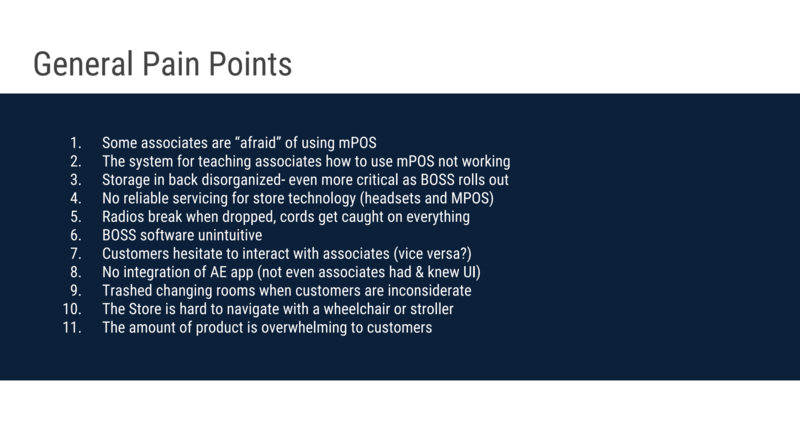 AEO took inspiration from Apple Stores and their integration of MPOS (mobile point of sale) devices, hoping they could do the same thing with their stores. Misguided decisions left them confused, and as we found out during research, copying tech of a different retailer, may not fit another context the same way. Employees and customers both were confused by the new tech and processes in stores and sometimes the shopping experience was awkward for both the customer and the associates. 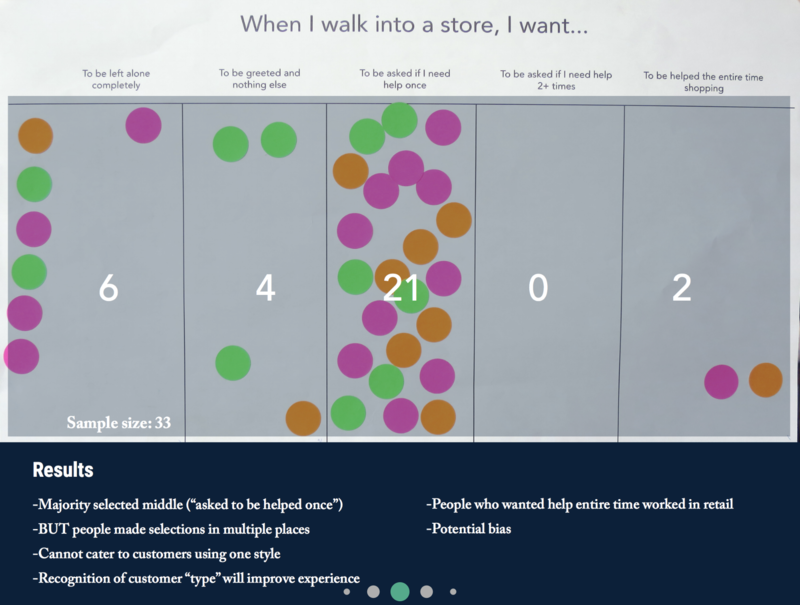 Things started to feel disconnected between the different stakeholders and the strategy started to blur between channels (app, in-store, online, social). 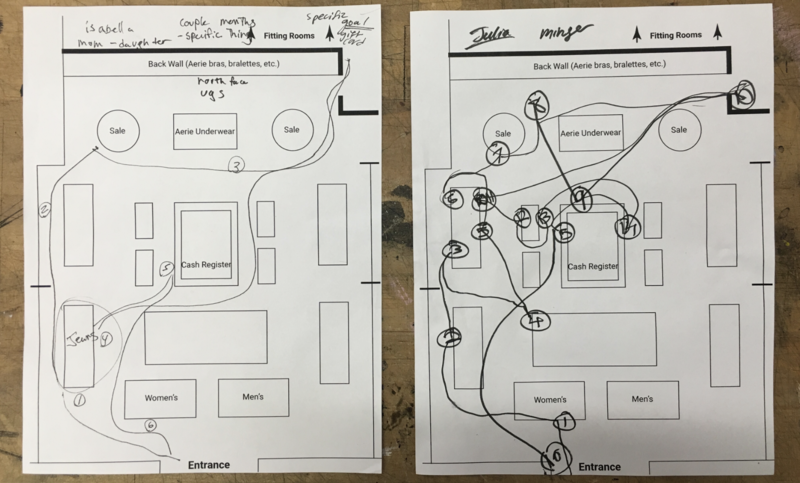 Not knowing much detail of the problems, we decided to start our research process with an observational and learning mindset, before making any assumptions for design. 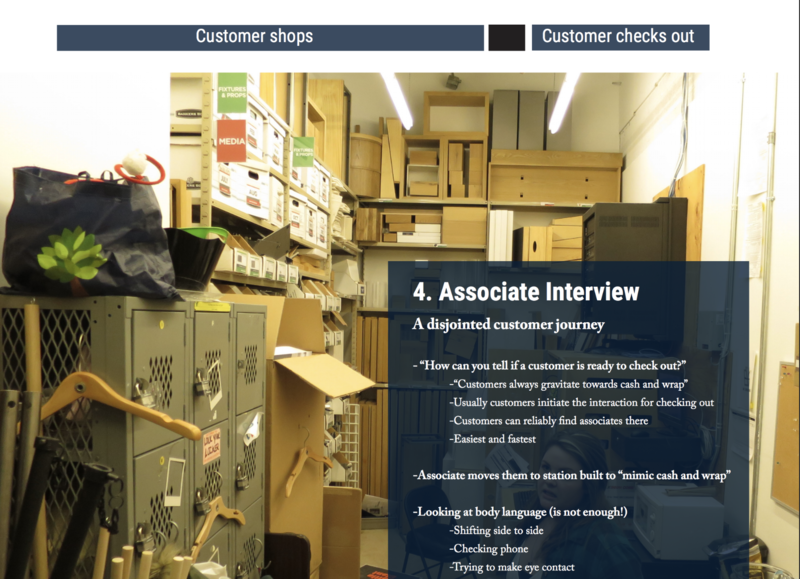 We wanted to deeply understand every touch point of the retail experience, seeking to understand how corporate, sales associates, customers, and the brick and mortar store intersect and influence each other/what role they play in the system. Phase-02: Generative Research to gain actionable insights from customers and associates. How do we start to answer our big questions from the previous research phase? 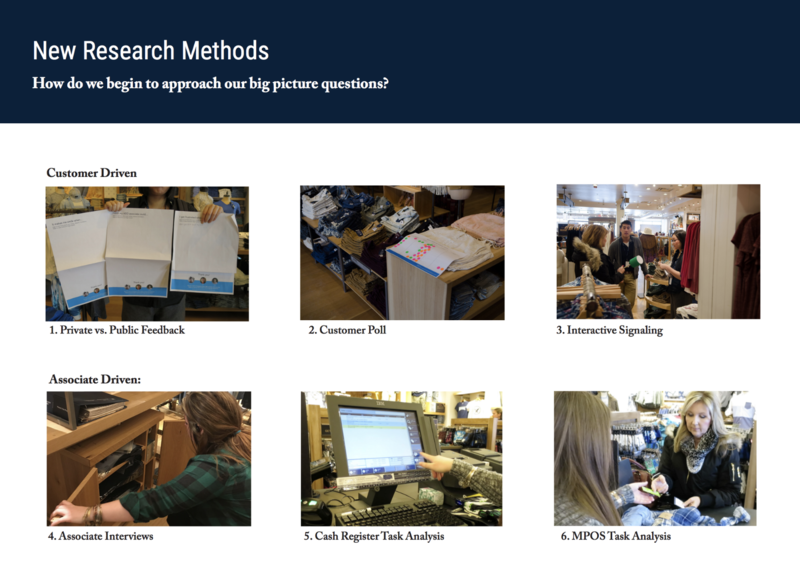 Together as a team, we put together an arsenal of generative research methods to get real customer feedback in scenarios that will give us greater insights than just observing or interviewing. 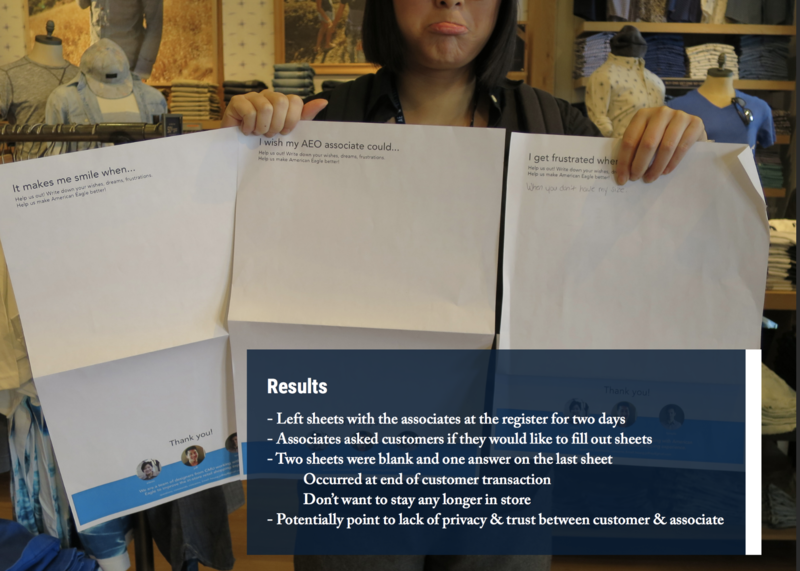 Again, we wanted to have an even balance of customer and associate-driven research methods. #WeAreAEO: Celebrating individuality and inclusivity by using tech for richer human connection. 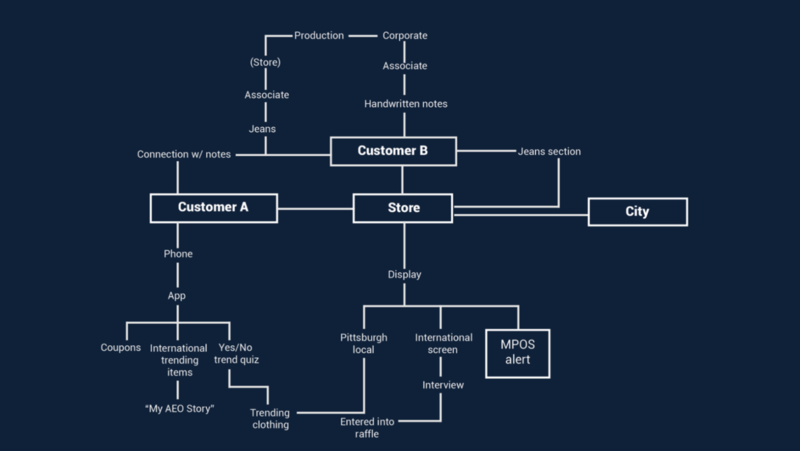 In partnership with American Eagle, my team conceptualized an omni-channel customer experience (in and out-of-store) drawing on American Eagle's push for inclusivity, improving the customer/associate relationship, and rethinking the role of the brick-and-mortar stores. 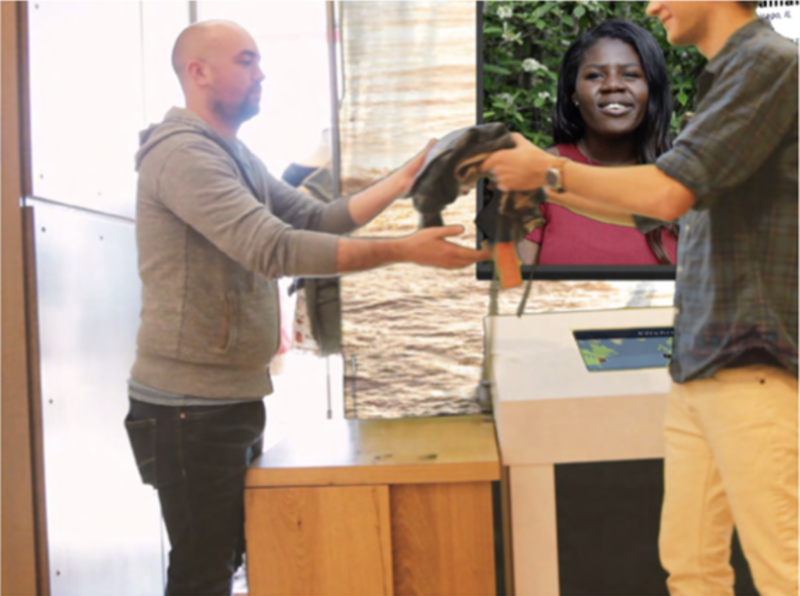 We strived to provide a shopping experience where you may be able to "feel inclusivity" at every touch point in the customer experience. ‍It connects customers to one another across a global community by celebrating individuality/diversity, while simultaneously emphasizing the unique and remarkable idiosyncrasies present in each individual's own city. When integrating tech into customer experiences, you need to be sure that it's not just because you're playing industry catch-up, rather that it's in-line with the company values and adds to the experiences placed in front of customers. Our approach proposes a technology-focused system to enhance, not detract, from the brand experience on all touchpoints globally. After our thorough research, we decided to use their value of Inclusivity as a lens to frame our approach. Put company values where people can feel it. 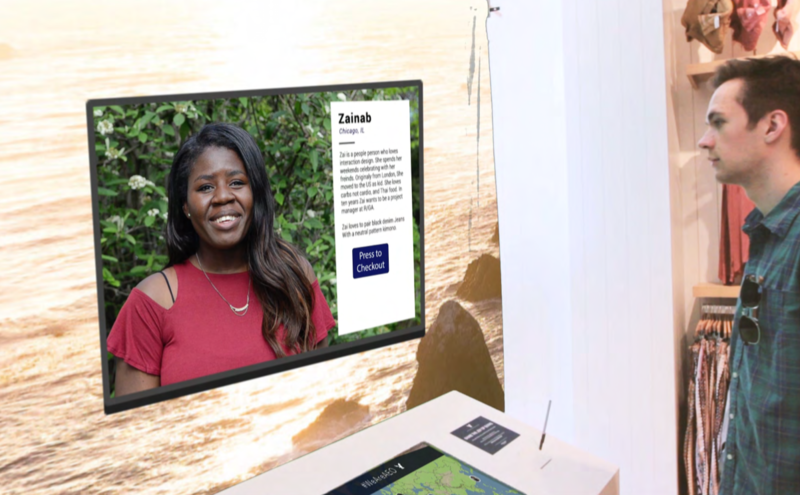 We don't want the ad campaigns to stress inclusivity, but inject the feeling of inclusivity into every touchpoint of the customer journey across channels. 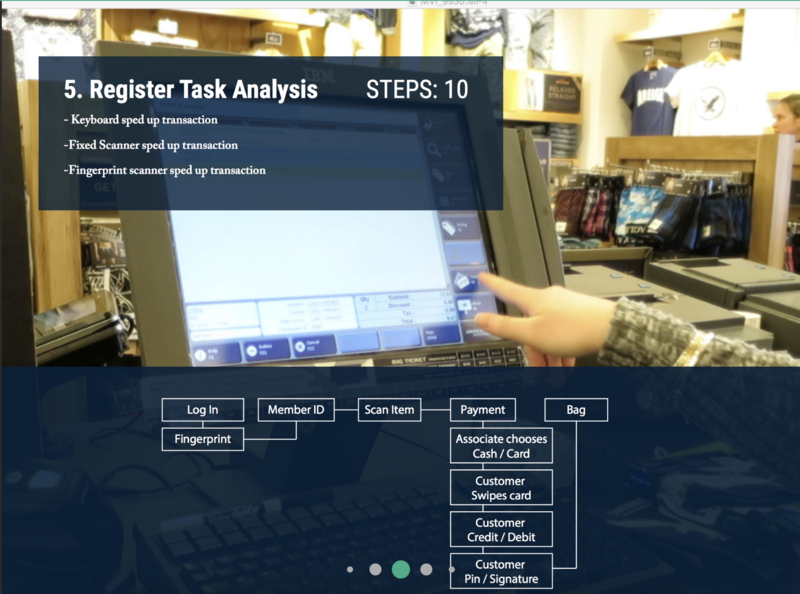 We’ve created a system both in-store and out, striving to create a perpetual feedback loop. We are striving to put the values of the company where the people can really feel it–along every touchpoint of the customer journey. What is inclusivity and how do we feel it throughout the brand? Allows users to play a larger role in the system. Drives home the same values of American Eagle in and out of your regional community. How do you create a sense of belonging in an Inclusive brand? One thing you can do is allow the members of a community to give back/contribute to the community. A huge opportunities lied in a customer-initiated interaction and leveraging the customers' personal devices rather than more expensive technology implementations in store.Our system first emphasizes the utility of downloading the mobile app to the customer, then incentivizes them to engage with the global and regional American Eagle community through the app. 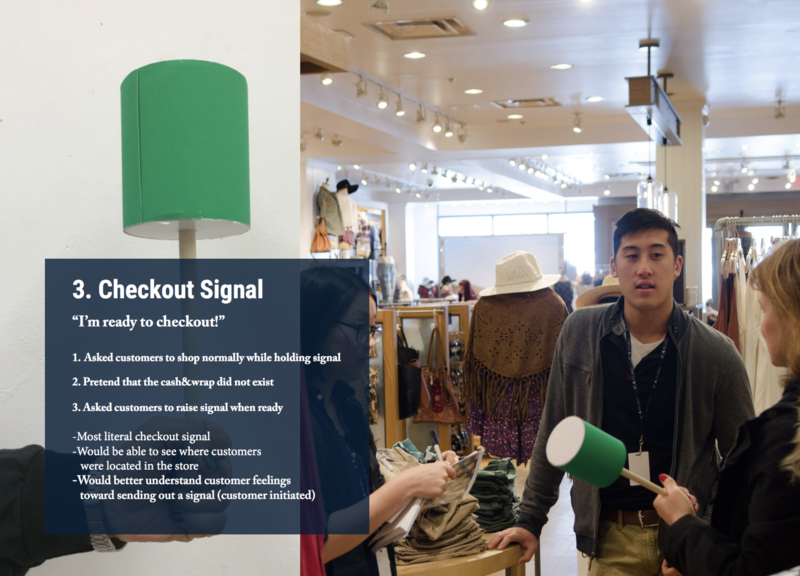 American Eagle had a mobile app with very low engagement that they were trying to get customers to use in-store with bluetooth beacons. This expensive integration was cumbersome and relied on the customers coming into the store with the app already downloaded and location services turned on. 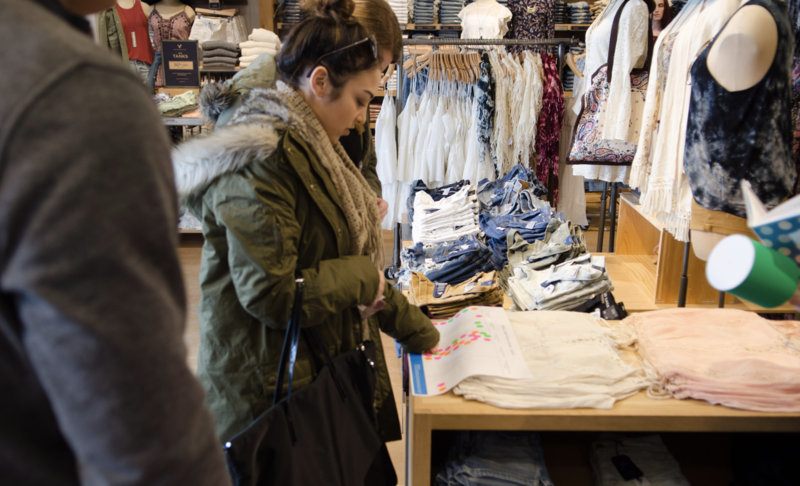 Many associates and customers did not know AEO had a mobile app or never downloaded it before to try it in-store. 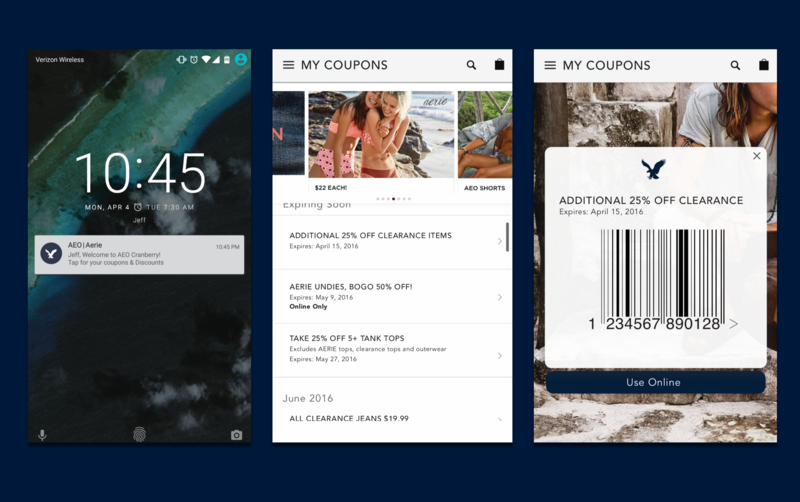 Allowing customers to access store and region-specific coupons and general offers within the mobile app and be reminded using location services when near an American Eagle store. 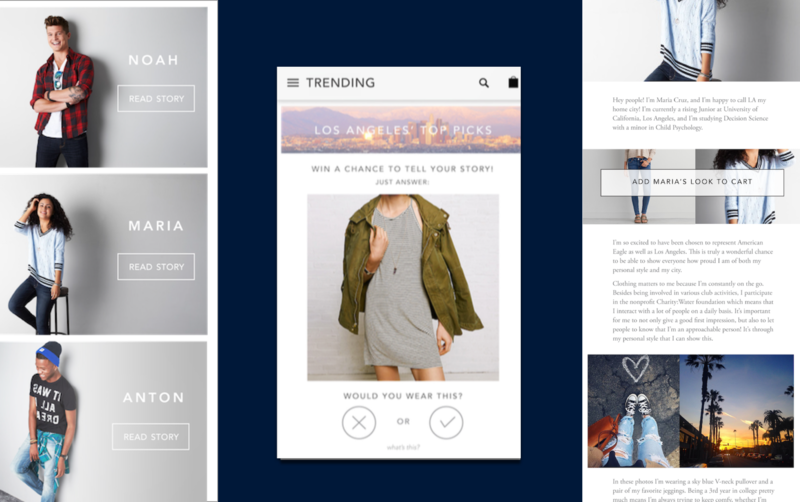 Providing the ability to vote and give your opinion on styles you like/dislike in a mobile app questionnaire. This enters you into a contest to be showcased & interviewed on the AEO app globally and represent your city. Giving an aggregated snapshot of what the top trending styles are across the global AEO community (i.e. New York, San Fransisco, Pittsburgh, etc). 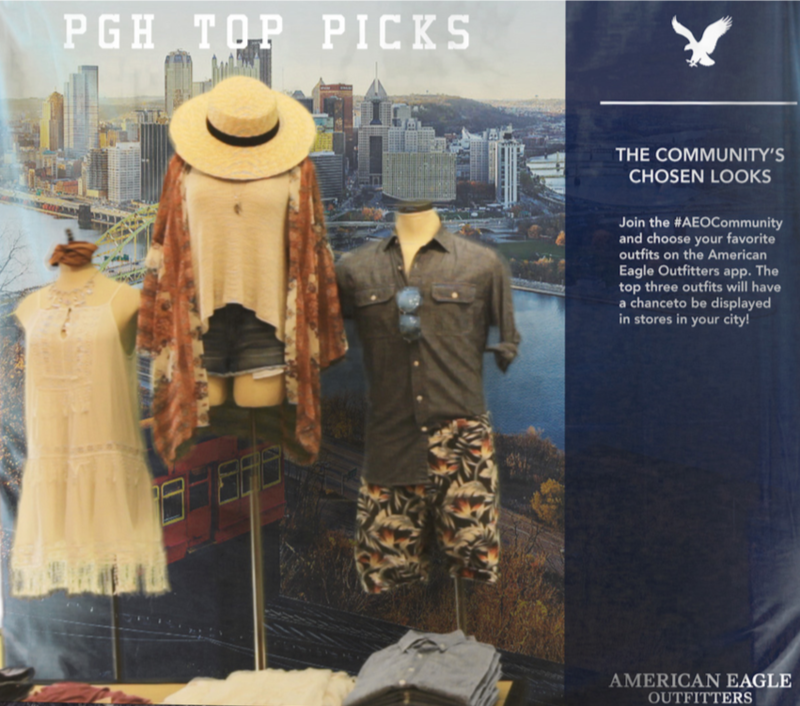 Users are able to read about other people who have been chosen to represent their city and given the opportunity to shop the winners' favorite American Eagle top style picks/the winners' regional trending styles. Celebrating individuals of the community makes customers feel recognized and perceive authenticity. 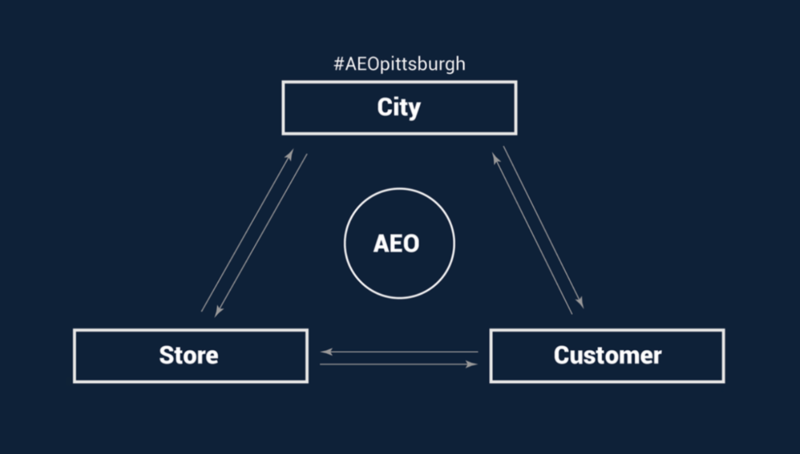 After many people answer the city-specific style questionnaire, AEO builds up data on the top sellers/styles representative of your city and region. This benefits both business and customers. 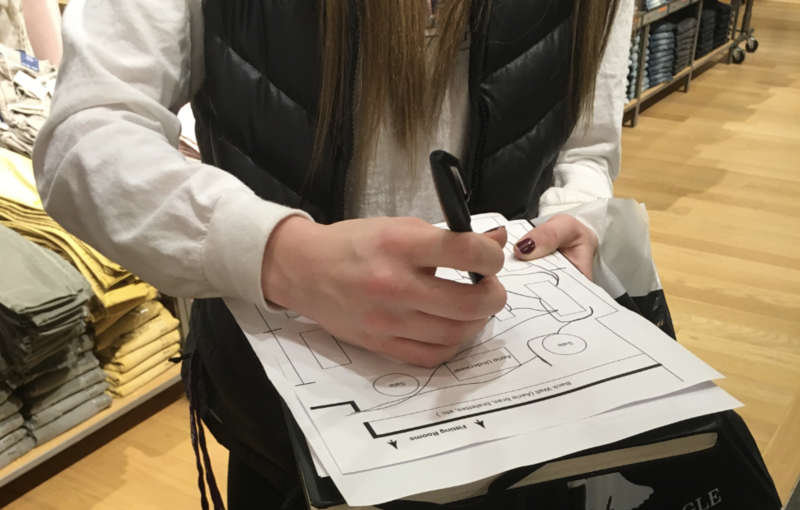 If a customer goes in the store (that filled out the questionnaire) and the outfit they voted for is picked, they can potentially see their input affecting their local store, or know that these styles are representative of their city, feeding back into regional pride and individuality. 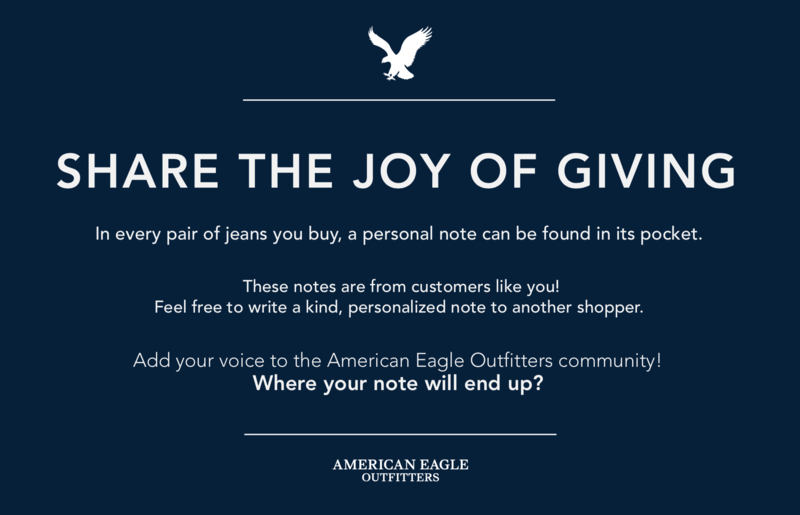 If a customer has not filled out the questionnaire, there is info encouraging to contribute/enter to win on the AEO App. This display does something similar to the stories shown on the AEO app. You can browse through people who were chosen from different areas. 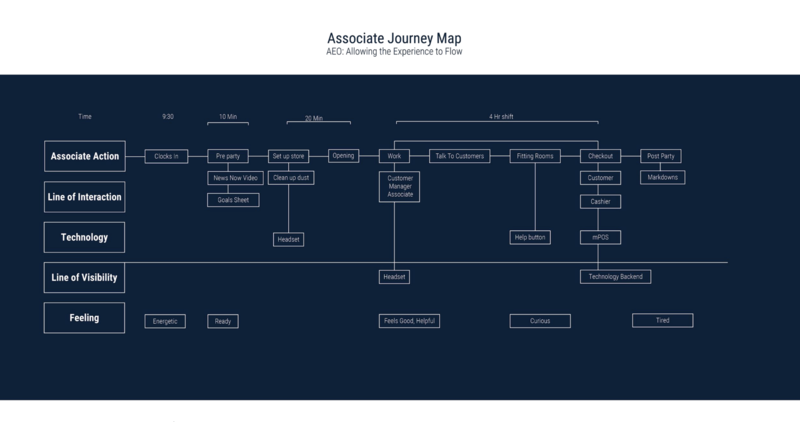 You can explore content about other people in the global AEO community. What are outfits in New York City like? San Fransisco? Chicago? 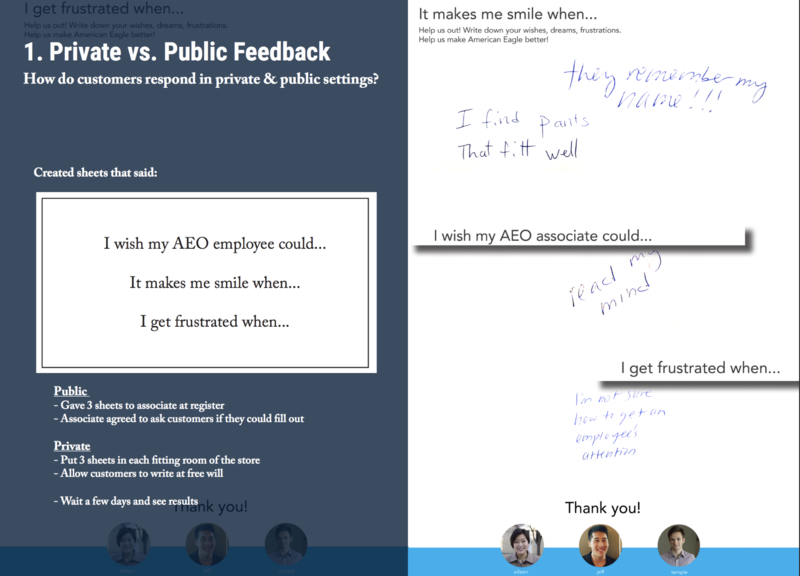 See what individuals perspectives might look like within the global AEO community - different or similar. The way we’ve divided things up by regional and individual people, gives people this sense that they are part of this community, but they are also celebrated as an individual in their own city. 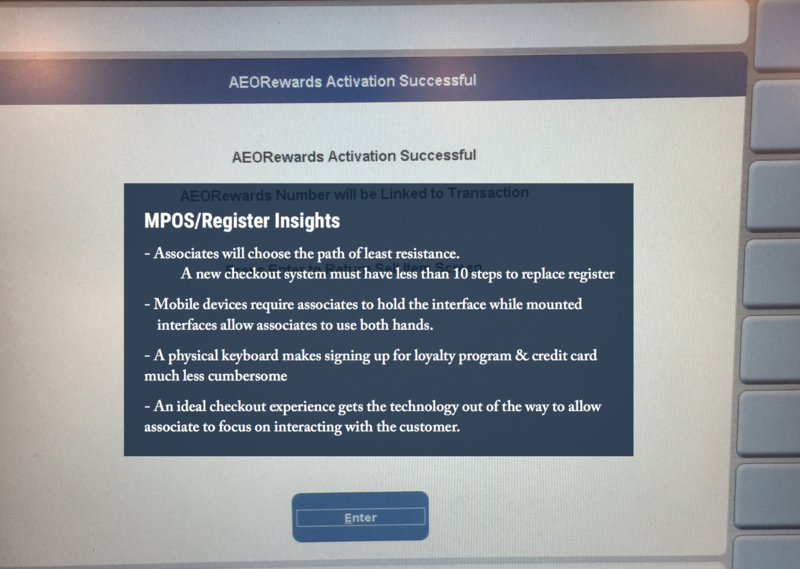 Theoretically, the MPOS will work 100% of the time. However, through our research, this expensive technology implementation came with complexities that rendered it awkward, uncomfortable, and underutilized most of the time. 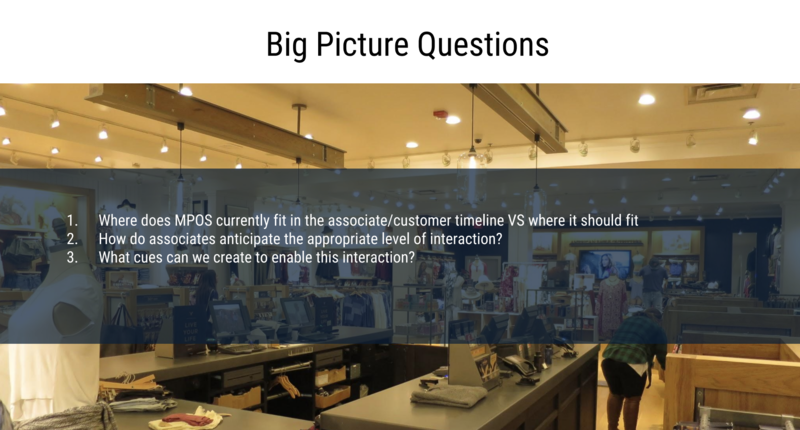 Being a customer-associate interaction, there were some trust issues that also served as blockers to the MPOS, resulting in a failed integration. 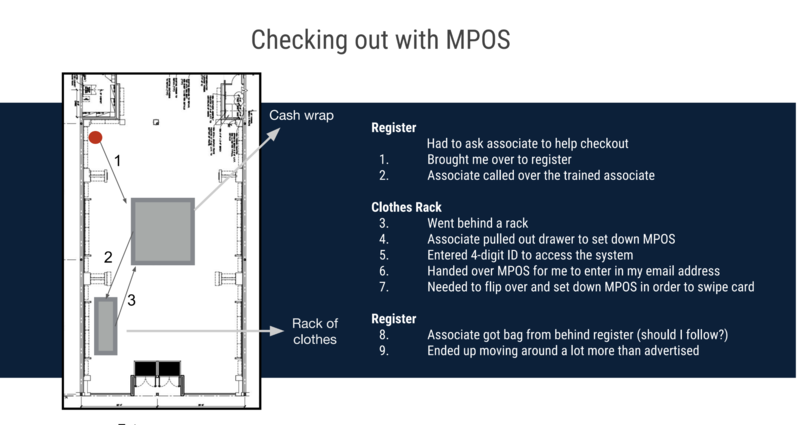 By adding in the MPOS into our system in this manner, we can reduce the complexities and issues of the MPOS (where am I supposed to go, how am I supposed to get the attention of the associate, do I just stand there while I wait for them to check me out? This solution gives associates and customers a surface to place merchandise down/hide store supplies, and reduce customer mental wait time. 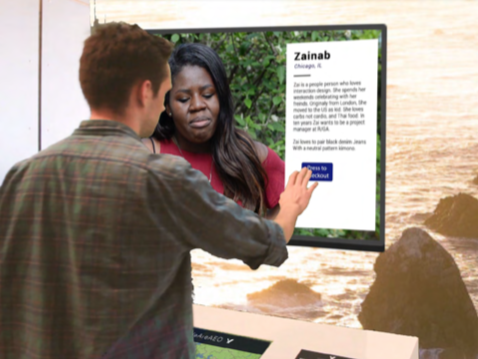 This solution also allows natural curiosity and distraction– forgiving any potential hiccups in the system that a customer might otherwise have to experience. 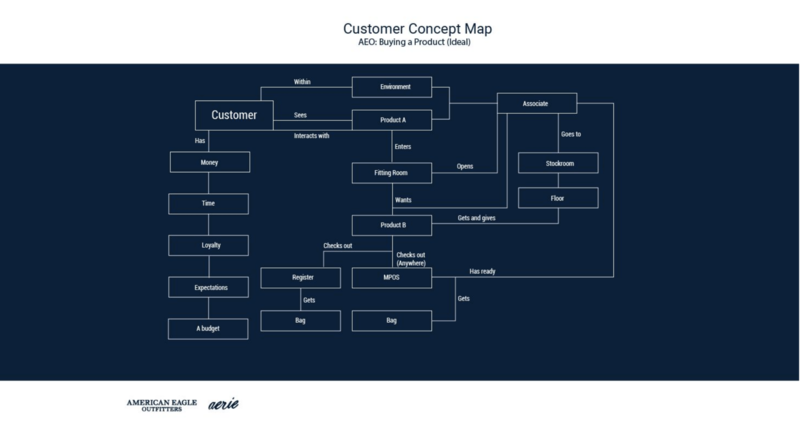 When talking about connecting customer to customer, this drives that bit of authenticity home with a handwritten note, included in each pair of jeans (AEO's flagship product). This little moment of delight, should put a smile on the customer's face, strengthening the connection between them, their city, AEO, and other customers.